This cruise features whale watching from the island’s best whale watching motor yachts, which are specially designed for stability and maximum outer deck viewing areas. Our vessels provide a smooth, comfortable ride and unobstructed 360-degree panoramic views, and from the foredeck you can often look down at dolphins playing in the bow wave. We cruise off Waikiki Beach and Diamond Head to see majestic Humpback whales, which are prolific during the winter months. The warm ocean waters off the Hawaiian Islands are teeming with marine life and we often also see Spinner Dolphins, Sea Turtles and Porpoises. Our Captain provides expert narration on Humpback Whales and other marine life. The yacht is equipped with a video monitor which plays whale and sea life educational tapes. A dipping hydrophone is used to broadcast whale song which can often be heard from the whales beneath the ocean’s surface. Roundtrip transportation from Waikiki is included. Snacks and beverages from our full bar are available for purchase. Whales are guaranteed; if they are not sighted on a cruise, our guests receive a “Whale Check” allowing them to cruise again FREE! (Whale checks do not include Waikiki transfers.) 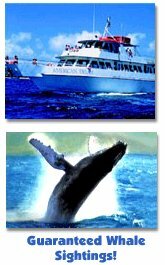 While onboard, Keiki (Children) are encouraged to participate in our “Keiki Whale Watch Program”. Upon boarding keiki are given the “Keiki Fun Book” (available in English and Japanese) to complete and keep. The “Keiki Fun Book” is filled with whale facts, games, puzzles and a humpback quiz. Upon completion of the Humpback Whale Quiz (the answers are part of the expert onboard narration), keiki can bring their Fun Books to the Pilothouse where the Captain will award each keiki a signed Whale Certificate indicating that they have attained the status of an honorary Keiki Crew Member Scientist. The Deluxe Menu: Morning Cruise - Scrambled eggs, grilled ham and Portuguese sausage, breakfast potatoes, steamed white rice, bagels, muffins, croissants, seasonal fresh fruit salad, soft drinks, juices, coffee and tea. Afternoon Cruise – Jumbo hot dogs, hamburgers, and cheeseburgers with condiments, potato salad, dessert, soft drinks, coffee and tea. The Boat: The American Dream has a sundeck with open deck area and perimeter seating and a main deck with an enclosed salon, open outer deck seating and extended bow pulpit. Capacity: 225 guests plus crew. The Crew: USCG licensed Captain; First Aid, CPR and lifeguard certified crew. Time: 1.5 Hour Cruise – Hotel pick-ups are approximately 1.5 hours prior to scheduled cruise / Check-in is 30 minutes prior to scheduled cruise. Daily Cruises: 7:30 a.m. / 9:30 a.m. / 3:30 p.m.
Inclusions All cruises include narrated whale watch cruise, round-trip transportation from Waikiki hotels, and a "Whale Watch Guarantee." The DELUXE cruise also includes breakfast or lunch buffet and beverages.